This short Bhutan sampler will get you to the heart of the country and serves as a quick immersion in its culture and geography. Flying from Kathmandu you will wing past the Himalayan giants of the central and eastern Himalaya including Mt. Makalu (8463 m.), Mt. Lhotse (8516 m.), Mt. Everest (8850 m.) and Mt. Kanchenjunga (8586 m.) in Nepal before crossing a small strip of India and then descending into the Paro valley flying past a host of Bhutanese mountains before executing a once in a lifetime landing at the airport in Paro. 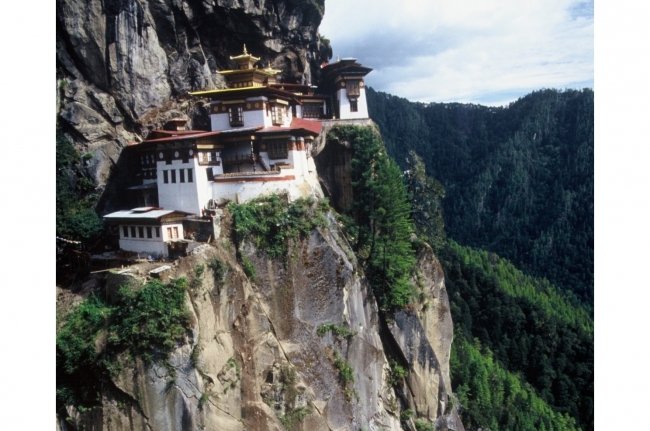 This tour takes in the capital of Thimpu, the spiritual and political center of Bhutan as well as the religiously important town of Punakha and the iconic Taktsang (Tiger’s Nest) Monastery before returning to Kathmandu to catch your flight back home. Arrive in Kathmandu. Depending on the arrival time of your flight sightseeing o Kathmandu. In Kathmandu to make last minute preparations for your trip to Bhutan. If you are sufficiently prepared then sightseeing of Patan Durbar Square, Swoyambhunath and Boudhanath. Day 03 Kathmandu to Paro , Bhutan . At an appointed time, transfer to the airport and fly to Paro. Drive to Thimphu and sightseeing of Tashi Cho Dzong (Fortress) and the Memorial Chorten (cairn) of the late King Jigme Dorjee Wangchuck, if time permits. Sightseeing of Thimpu including the Dupthop Lakhang, the National Library, the Traditional Medicine Institute and the Changangkha Monastery. Sightseeing of the Ta Dzong and the Rinpung Dzong and drive to the starting point for the hike to the Taktsang Monsastery popularly known as the Tiger"s Nest. Return to Paro. Day 07 Journey to return back in Kathmandu / Additional Sightseeing . At an appointed time transfer to the airport and fly to Kathmandu. Additional sightseeing in Kathmandu. Day 08 Trip ends / Fly back to next destination. At an appointed time transfer the airport and depart from Nepal.